Parents, students, and community members flocked to see the art on May 1, 2012 during the opening reception of the AHML district wide art show. The 2-D banners line the foyer as 3-D pieces fill the display cases with student artwork from every K-8 building in Arlington Heights School District 25 schools. Stop in anytime during the month of May to view this display and enjoy the creativity and talents of our children. 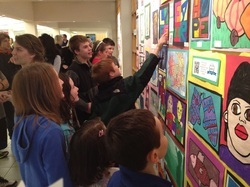 AHSD25 Elementary Visual Art Program Celebrates it's 20th year ! In the 1992-1993 school year, Arlington Heights School District 25 began implementing a comprehensive elementary art program for all 7 elementary school buildings as a result of the community passing a referendum. Each building was remodeled to include an art room. Students received art once every two weeks for one hour with art teachers traveling to two buildings each. The staff was added to in the next years to increase student contact time and give school buildings a dedicated staff member. Children now have art once per week for 45 minutes in 1st-5th and for 30 minutes per week in Kindergarten. Some of the early staff members are still teaching art in AHSD25 including: Emily Cook (currently at South), Irene Byun (Patton), Tricia Fuglestad (Dryden), Cammy Avella (Ivy Hill), and Mary Olson (Windsor). The elementary staff also includes Brenda Miller (Westgate), Janet Bishop (Greenbrier), and Fred DeMarco (Olive). Arlington Heights School District 25's Art Program was awarded the Illinois State Board of Education Those Who Excel Award of Excellence as a team in Springfield, March 2003. The Award of Excellence is the highest honor given by the Those Who Excel award program. Pictured here from left to right: MaryAnn Mikelson, Ann Musolf, Tricia Fuglestad, Ronnie Brennan, Emily Cook, Cammy Avella.